Unrealistic football fans – are they actors? 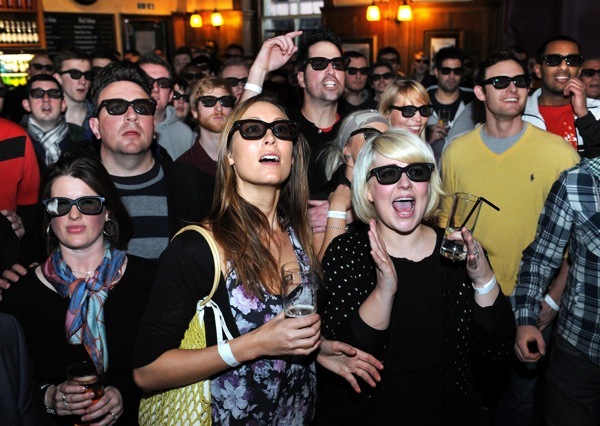 – watch the world’s first live 3D TV sports broadcast football match, between Arsenal and Manchester Utd in the Railway Tavern in central London. Shouldn’t Theo Walcott have been at the game? what the hell is on that girl’s glasses all the way to the left, she looks disappointed!! I suppose you could have said that about the entire Arsenal ‘defence’…..
Take a look at this Manchester United Memorabilia website. They have an excellent array of Wayne Rooney Memorabilia a signed team shirt and many other items.